The site of Tyburn tree is very close to Marble Arch. What is now right at the heart of bustling London was once outside the city bounds in Middlesex, and used for executions for this reason – for six centuries. In this time over fifty thousand people met their deaths there. From 1535 to 1681 Tyburn was transformed into a place of cruelty, torture and execution for men and women because of their religious belief. It had become an act of high treason to be a Catholic priest, or to associate with Catholic priests. It was also legal treason to refuse to accept the monarch as “the only Supreme Head on earth of the Church of England”, in the reign of King Henry VIII, from 1534 onwards under Elizabeth I, Charles I and Charles II. Tyburn had been a place of public spectacle where crowds gathered for entertainment. The martyrs, however, brought a new spirit into the barbarities and butchery of Tyburn. This new spirit was one of joy, spontaneous humour and wholehearted forgiveness of those who had brought them to their life’s end at Tyburn. This spirit flowed over into the crowds around the Tyburn Gallows. When Blessed Thomas Maxfield was dragged to the Tyburn Tree in 1616, the Gallows had been adorned with garlands of fragrant flowers while the ground around it was strewn with sweet-smelling herbs and branches of laurel and bay. 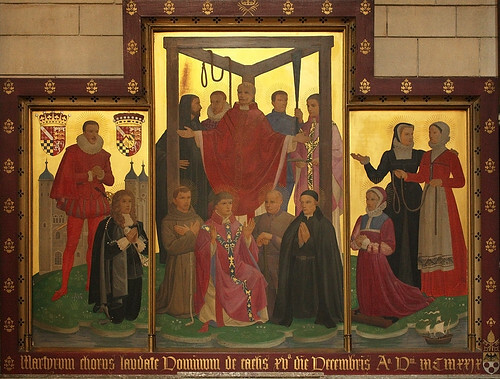 “Thus”, write the nuns at Tyburn Convent, dedicated to those who died, “the holy Martyrs transformed Tyburn’s Deadly Nevergreen Tree into the Tree of Life and the Gate of Heaven, which it remains to this very day”. The nuns continue to live in this spirit, and, although living an enclosed life, offer their prayers in perpetual adoration for people in all walks of life, including prisoners. The site of the gallows is now marked by three brass triangles mounted on the pavement on an island in the middle of Edgware Road at its junction with Bayswater Road. Click on this link to see a Google earth image of the modern day site. 18.05.2009 We had a comment from Fr Tim Finigan to say that the monument is now restored – you can see a photo of this on his blog.